Paying for water at restaurants, would you? Do you have a concern paying for drinking water when dining at restaurants or cafes? I find it a disturbing trend. It is almost ubiquitous for restaurants to charge customers drinking water. And most times, they serve water from tap which doesn't quite make sense to me. Maybe it makes a little more sense now due to the water hike. When restaurants don't serve or charge for water, I deem them as being unfriendly to our little diners and elderly grandparents who do prefer a healthier drink option. 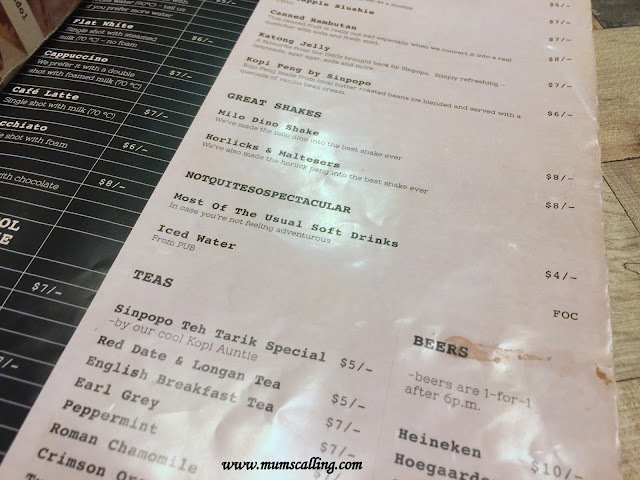 How inconvenient is it to serve water in a restaurant, one that taxes and imposes service charge especially? For this, I'm quite certain the number of non-water option have risen among diners. Did we just hear about a healthier drink option at the National Day Rally? Recently, I was out lunching with Jazz when it was one of the rare incident that we left our water bottle home. We requested for water and was turned down. I was so dumbfounded that I didn't bother asking if there was even an option to purchase bottled water. If there are options, I am not inclined to purchasing bottled water. It's totally environmental unfriendly. So then, when I requested for a cup of ice, they gave! On a wise note, we can simply wait for the ice to melt at the expense of hoarding onto their seats. That was however not my intention. I had Juboy's hot water in a vacuum flask and I thought I could cool it with ice for Jazz. I have ordered a good spread of food and will be paying for my fancy drink. I just need water for the kids. food is overly dry that I need water to wash it down my throat. In case I create a choking saga at the restaurant. Which means, food is bad tasting! our tap water, which is also our pride, is safe for drinking. served water is not boiled or filtered, but off the tap. I need to help the planet by not purchasing bottled water. we want to promote healthy drink choice among the kids. 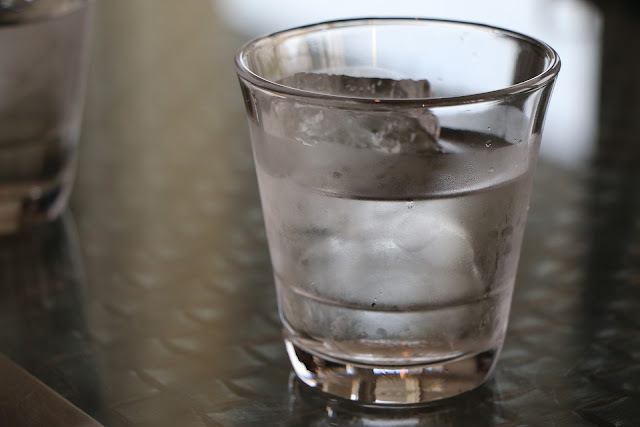 Yes, 10 solid reasons that consumers should not pay for water when dining at restaurants. It is embarrassing that charging water or choosing not to serve water has become a dominant trend. How did our cost of living get this calculative?!! With that ability to set up cafes, restaurants and even mega chain of restaurants, what is the cost of serving water from Public Utilities Board? If I can request for additional plates and cutlery without the restaurant being mindful about the cost of washing them, why not serving water? It's probably about the same amount of water used to wash another plate. Coming to dessert joints, it is absolutely unkind that water comes at a cost. How often have you encountered being desperately in thirst after sinking your teeth into sweet tasting dessert? Water should be freely available! And I've one kind soul in mind. Kudos to Udders who offers free flow water from its cooler and even with tissues available conveniently! Though it's self help, it's highly appreciated. Shall leave you the brain work of listing the misers. I cope being a whiner by bringing our water along for meals. There are just some days when our water runs dry after a long day out. So yes, I do give in to purchasing water. Most importantly, I want to advocate the kids that water is always the best option. Dear Consumer Association of Singapore, I think this is worth a serious thought. Even though Singaporeans love eating out, our interest and trade should be considerately protected. And since I am on this, may I add that food or items that require a charge shouldn't be left on consumer's table for double guess if they are complimentary or not. Talking about nuts, crackers and wet towels that you have to reject upfront, if not it goes into the bill. Automatically. Such can be a rude shock to tourists. To the minority of restaurants with that gesture of serving free flow water, Thank You for breeding such good will among customers. Much is appreciated from families with kids and elderly. But seriously, can we impose some regulation on this? Like if you want to run a restaurant or cafe with service charge, especially if selling alcohol, serve complimentary drinking water! It has been a bugging thought to ask if Jazz would like to recommend and review books that made it into her favourite list. She reads a wide range of books. More than me. I am glad that she agreed to do a recommendation, and I am more than happy to share this online space with her love for books! So here's her first post of book review. All on her own, with very minor editing from Mummy. In case you start wondering on the grammar, structure and flow. Good effort from an eight year old, I thought. The book I would like to recommend is 'The World's Worst Children.' This book tells the tales of the world's 10 worst children. 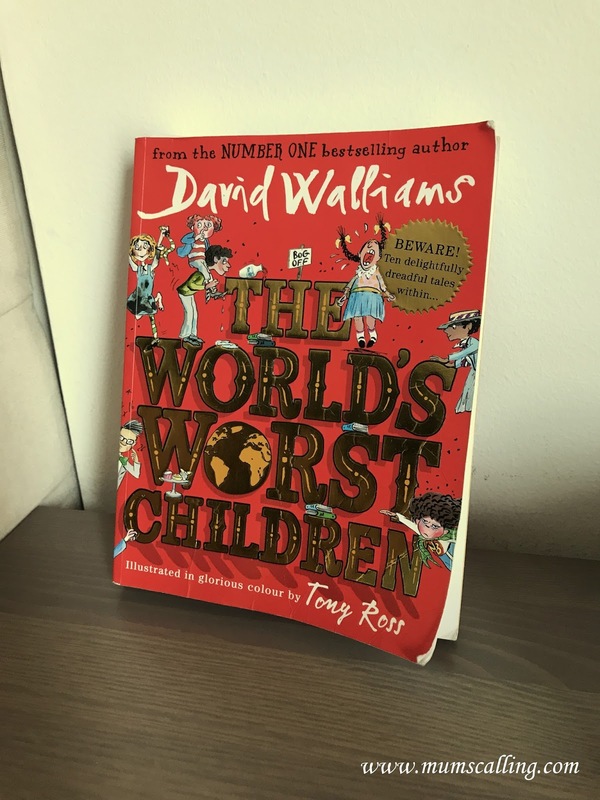 The author is David Walliams. I am a big fan of his books. 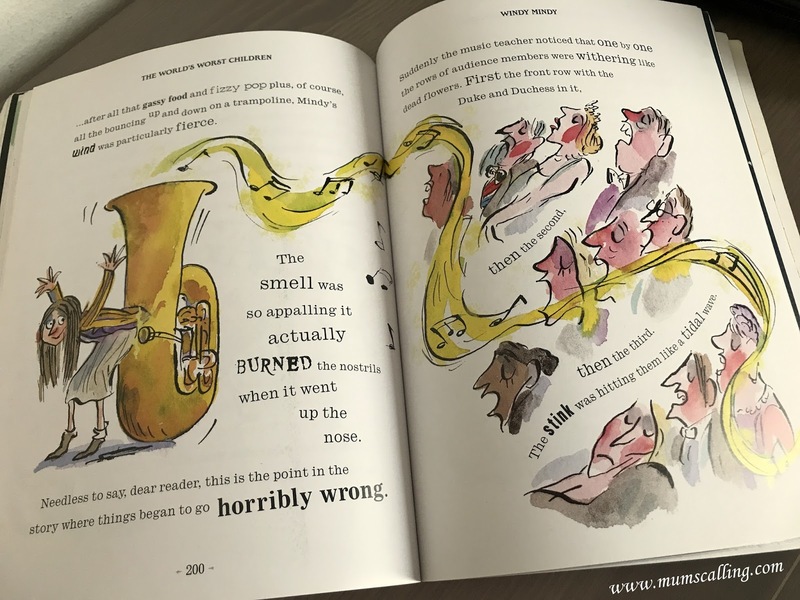 The first child in this book is Dribbling Drew, a boy who dribbles drool. He causes disaster wherever he goes. On an adventure in the Natural History Museum, he fell asleep and created a sea of drool. He loves sleeping so much that he had heavy consequence of not being able to sleep for the next 10 years. The next story is Bertha The Blubberer. Anything and everything would set her off. Bertha has a brother called William. She hated him the moment he was born. One day she had a wonderful idea, she would cry and cry and blame it all on her brother. She is a very dishonest girl. A lie will always be found out, and she got an extremely bad punishment. The third story we have, Nigel Nit-Boy. Nigel loved nits. What is so interesting is that this ordinary boy became the most evil villain who causes trouble wherever he goes, stealing toy and spelling rude words. In the end he was over. Now he is a new super villain. Fourth, we have Miss Petula Perpetual-motion. This is a story of a girl who could not stay still. She creates pandemonium wherever she goes. She goes to a posh boarding school, Modesty Place. On a trip to a porcelain museum, Petual got the head mistress into a lot of trouble. This always manage to get away. 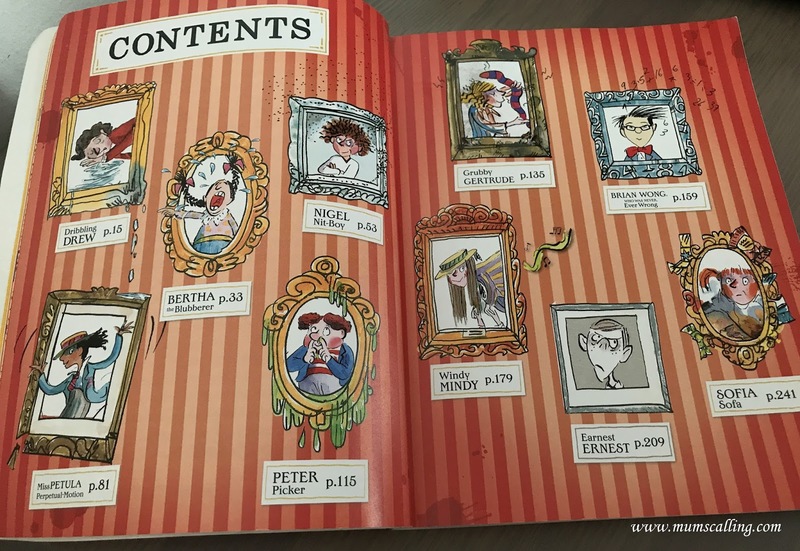 The fifth next revolting child is Peter Picker. He picks his nose to find snot. 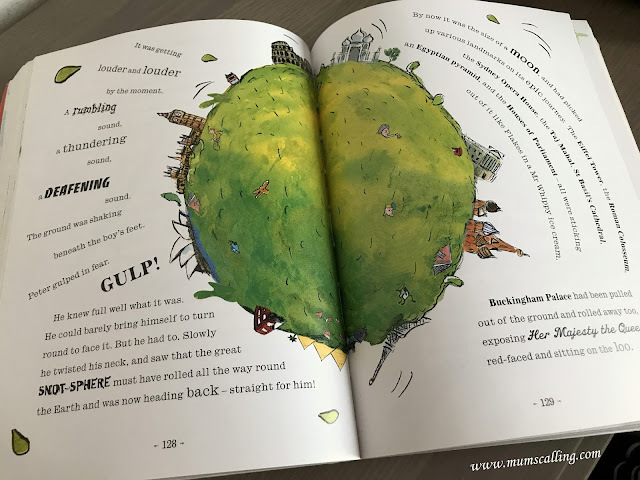 He wants to make it into the world's record of the biggest bogey, his gigantic ball of snot causes mayhem all around the globe. His giant ball breaks free and rolls around the globe with various land marks including Buckingham Palace, exposing Her Majesty The Queen sitting on the loo! The queen ordered her guards to fire at the giant ball of snot. Everyone returned to their normal places except one small boy. Our sixth child is Grubby Gertrude, this girl loves being dirty if you entered her room you would see a rubbish dump. Her mother is a very clean and neat lady who wanted to clean up her room, but failed. Some thing had broken her vacuum cleaner, which in the end, that thing ate Gertrude up. Seventh, we have a really clever boy, Brian Wong who was never ever wrong. Wong feared that one day he might be proven wrong. His Math teacher was telling the class that nobody can count to infinity and Wong thinks that it can be done. He didn't want to be proven wrong, so he kept counting and forgot about his family and friends. Eighth, Windy Mindy. She discovered she could break wind and had a list of things that would make her bottom burp. She is a very mischievous child. One day she discovered a new talent, she could use her wind to play the tuba. While playing at a concert at The Royal Albert Hall, it accidentally sent mindy flying into space.Never to be seen again. Ninth, we have Earnest Ernest. Ernest had made it to twelve years without cracking a smile. He had super boring hobbies such as collecting pencil, sharpeners and photographing traffic lights. His favourite hobby was guessing what type of metal objects were made of. His clothes and everything was grey as it was the colour of metal. His diet is cold peas. His mother brought him to see a professor. They succeeded in getting Ernest smile, but he laughed at the misfortune of others. Last but not least, we have Sofia Sofa. This girl glued to the TV. She would watch it no matter what was on. For watching it everyday, she soon became wedged with the sofa. She is now a half girl half sofa and half TV. Ergonomics in simple term is the study of people's efficiency in their working environment. In terms of products, it is the process of designing or arranging workplaces so that they fit the people who use them. In terms of kids and ergonomics, I believe sitting with a good posture increases stability and provides a sturdy foundation for written output and can increase attention and focus. It's been our longest thought ever to get the kids some proper tables for writing. Not that they haven't got one, but theirs have been long outgrown. Jazz is 8 and Jare is 6, it's high time we proceed from their preschooler IKEA tables to ergonomic tables and chairs. A search around we were appalled at the prices ergonomic tables are. And that we have 2 school going children, we needed 2 sets that work within our budget. 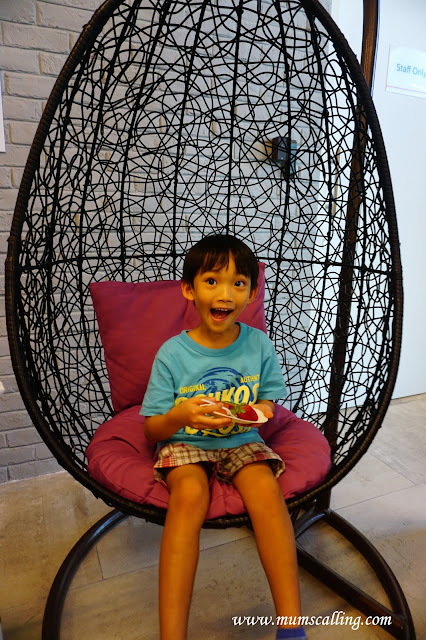 We thought this hunt from take A seat is quite a gem, which most importantly, the kids love it! 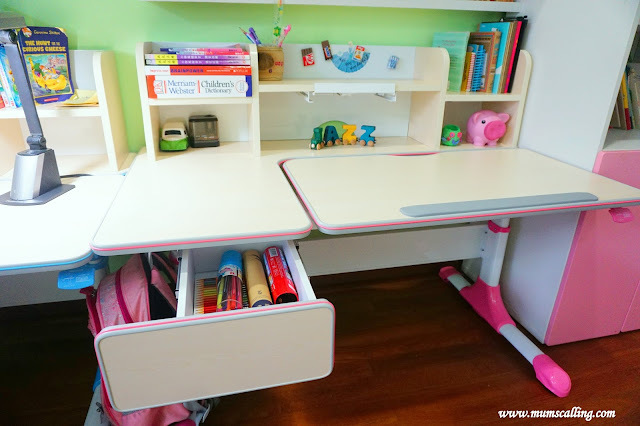 We set our eyes on the E1200 Kids Ergonomic Study Table Set. 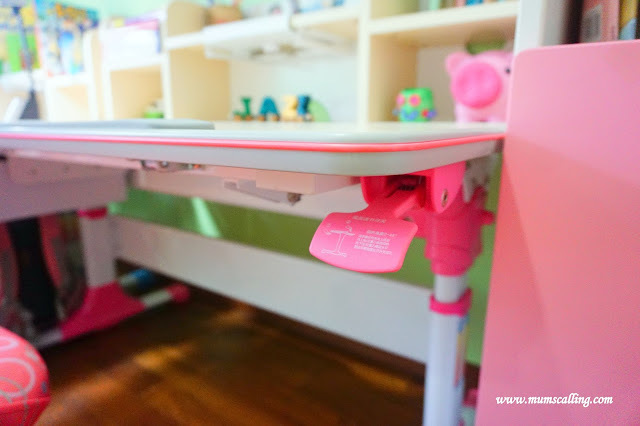 It measures 120cm by 75cm with an adjustable height of 56cm to 76cm from the floor to the desk surface. If you do some visualisation, this is one that will go a long way in the kids' years of studying. It is one suitable for ages 3 to 18. The only consideration most parents are willing to spend much on ergonomic furniture is that they last a long way for growing children. To adjust the height of the table, it can be easily adjusted by turning the side lever clockwise or anti-clockwise. 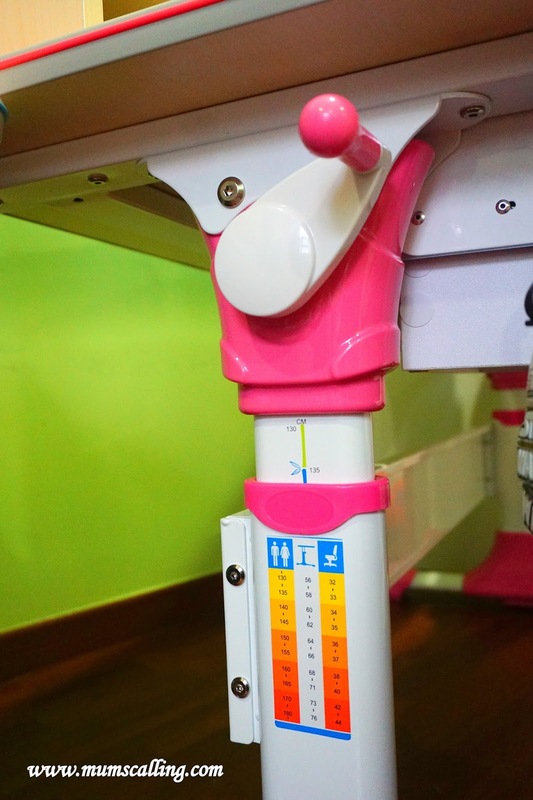 This German design cranking system for height is an easy and effortless adjustment, where even the kids can handle it. It won't be one that will be frequently adjusted though, unless they are working on a project that requires their standing posture. On the leg of the table, there is a recommended height and level chart to adjust the table according to your child's height. We love how clever the table is designed to only incline one bigger part of the table. 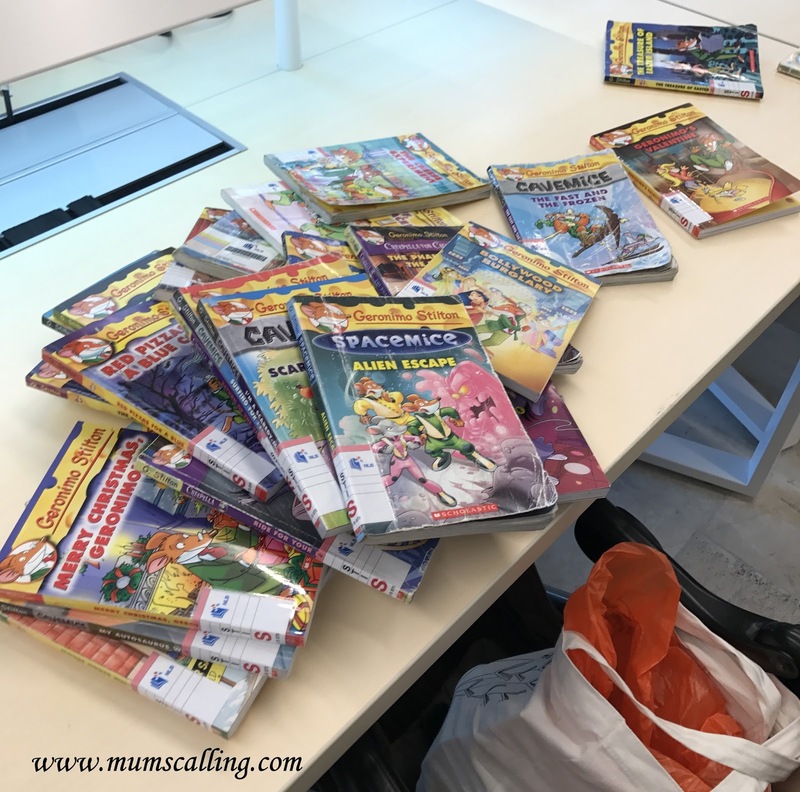 Which means not all books sitting on the table will slide down, they can be easily carried over to the left to sit on the fixed level, while inclining only the right. The inclining of the table is of certified hydraulic gas lift. The inclining and declining is one that can be easily handled by the kids too. I had a tad concern that they may get their fingers caught from the inclining and reclining of table, but weeks into it, everything is good. They know the drill and is always on a look out for their little brother. I did have a slight concern when the kids wanted to put toys and display items on the shelves, but I managed to convince them on putting only frequently used items and books on the shelves. The last I will like to see is the shelves being cluttered or accumulated with dust with untouched items. With shelving provided there really isn't much consideration about getting any storage boxes for that part of the table. 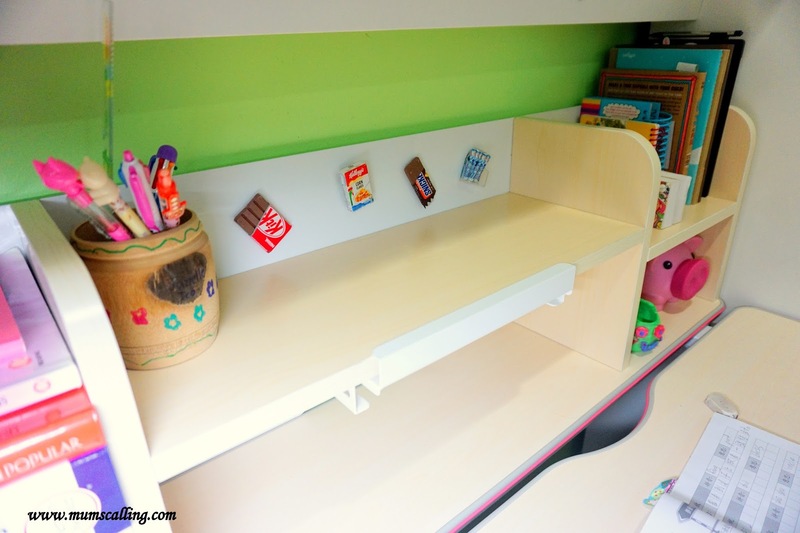 There is one drawer space to keep their stuff or any unsightly things that don't go well on the table. It's a pity that there isn't a compartmentalise drawer to organise stationery, but that can be easily contended with a pencil cup holder. Do you often nag the kids on keeping their bags away? I do! 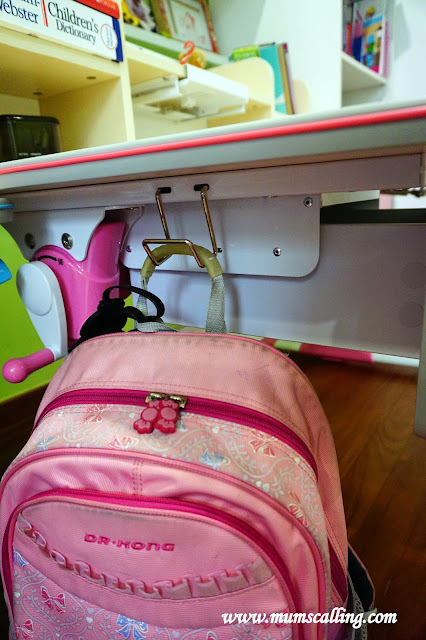 The table comes with a metal bag hook that allows them to hang their school bag by its side. It holds and tucks the bag neatly under the table. Space saving I thought! We had our tables placed side by side, and it didn't hinder too much when the kids tried to hang up their bags. It may be a little tight though if they want to rummage through their bag while hooked up. The kids insist on that being a gadget holder, but I like to say it's a book holder because they don't have any gadgets to own. So yeap, it's good for putting books and especially good to open hold a book while they are copy referencing. Brilliant idea! Don't have to fumble with holding a book page down and copying. The book holder may be stowed away neatly if not in use. I have a roaming 1 year old, so having a table with rubberised edges is highly critical, considering his eye and head level is also about the height of the table. Safety! 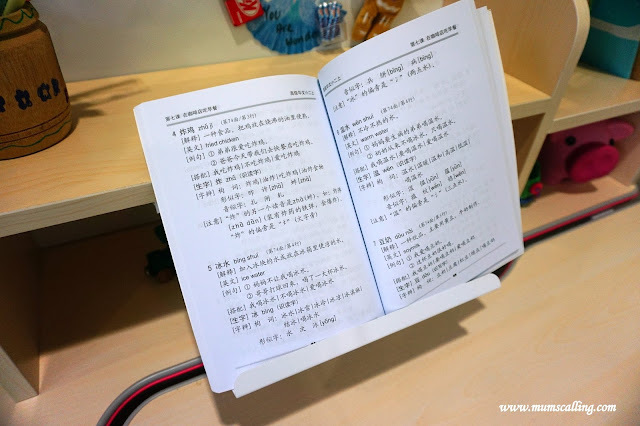 A table without wheels is highly sturdy and stable, there's no rocking movements during writing. Though I did wonder about relocation, I had rather not compromise on stability. The table does weigh quite abit, so it's best to have a firmed place of where you had like to put it before setting it up. We love this board that allows the kids to hold magnets and clip little notes, reminders or photos. Which can be aesthetically refreshing to those eyes. The table is made of non-reflective laminate wood and is easy to clean and wipe if there's any water spill. This model comes only in blue and pink. I think having a neutral colour like grey or brown may be a good idea too. To better match more theme rooms. If space is a constraint, you may consider the other model, E950 which measures smaller in length and width. The Ergo Prime Kids Ergonomic Study Chair comes in both pink and blue. We got blue for Jare. 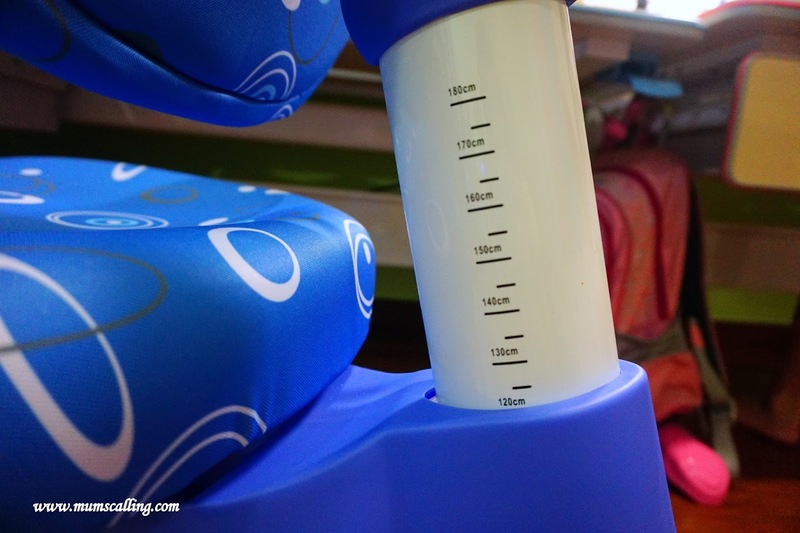 It measures 43cm by 42cm with an adjustable height from 31cm to 56cm. 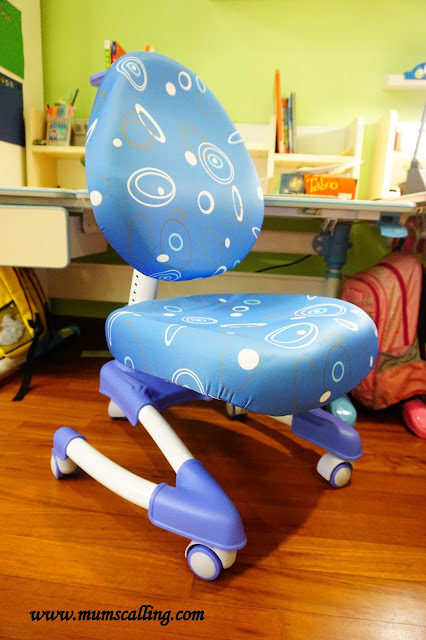 The seat depth and back rest of the study chair can also be adjusted to suit the child's individual needs. The height and depth adjustment is one that may require the assistant of a grown up. This height gauge feature allows us to adjust the chair to Jare's height without guessing with trial and errors. 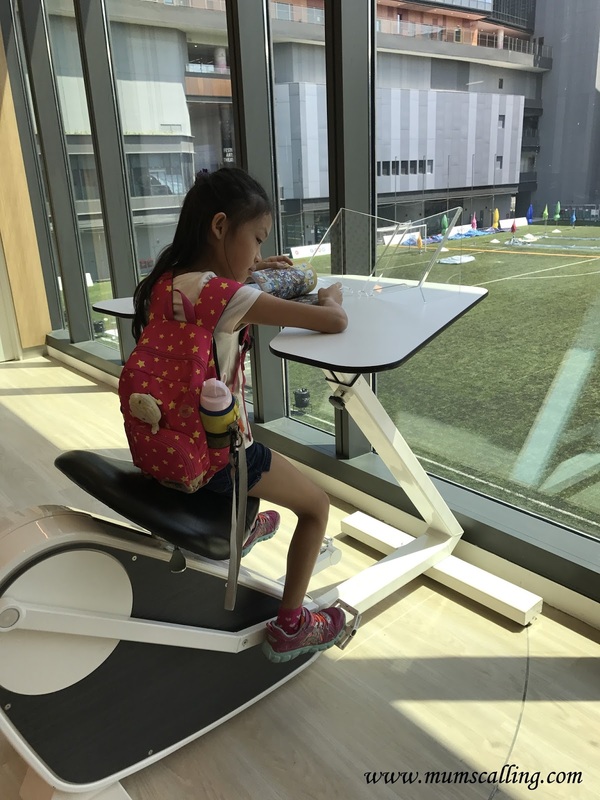 It also has a gravity braking system where it automatically locks the chair wheels when a child sits on it, preventing them from moving around or sliding unnecessarily away from the table. This is another one feature that is highly considerate for our roaming one year old. I've gotten my feet and kids' feet rolled on countless times by my roller swivel chair. It's ouch! We got the Ergo Mind Kids Ergonomic Study Chair for Jazz, which is also comparatively good. They are however phasing this out and is only left with pink at the moment. I was honestly more comforted and convinced when the pieces came with warranty. It is 3 years for the table and 1 year for the chair. It covers the malfunction of the tables and chairs, without including wear and tear. It sounds like an assured buy now, isn't it?!! Prices are already inclusive of set up and delivery. What you see is what you get and pay. 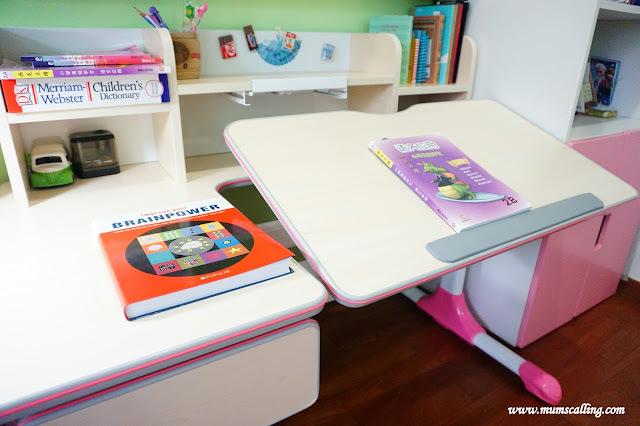 The E1200 Kids Ergonomic Study Table Set is priced at $600 and the chair is available for top up at an additional $149. You may head down to their showroom to view the furniture pieces and other designs. Their salesman do not over flatter their products, what you need to know or want to know will be responsibly make known. So yeap, the sets are manufactured in their China factory. Nonetheless, they look and feel really strong and durable. Otherwise I wouldn't be collaborating with them. We are much happy and satisfied with the tables and chairs. Most comfortingly, we know we have provided the kids a suitable writing and reading space that is readily available in the home. I grew up writing and working everywhere else other than a proper table and chair to be called my own. It feels really accomplished, as parents to provide the kids a good and proper space for work. With ergonomic furniture being a bonus. Primary school registration has just ended. We know sourcing for a writing table and chair is next in mind, a discount code may help ease your decision a little. 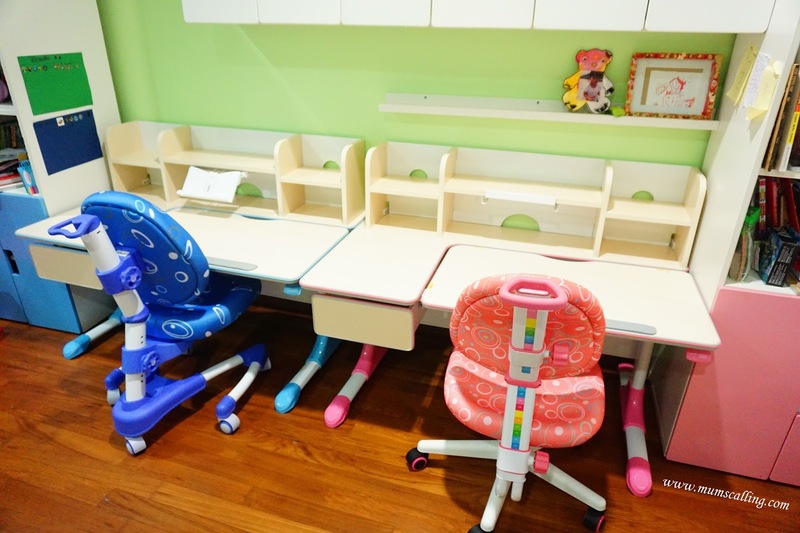 We have got a 5% discount code for all kids ergonomic tables and chairs purchased online from take A seat. Shop and check out with code 'mumscalling17'. We hope this made the deal sweeter. Discount is valid from now till 10 October 17. Disclaimer: We were sponsored a set of table for chair for the purpose of this review. We bought another discounted set additionally on our own expense. All photos and opinions are solely ours. 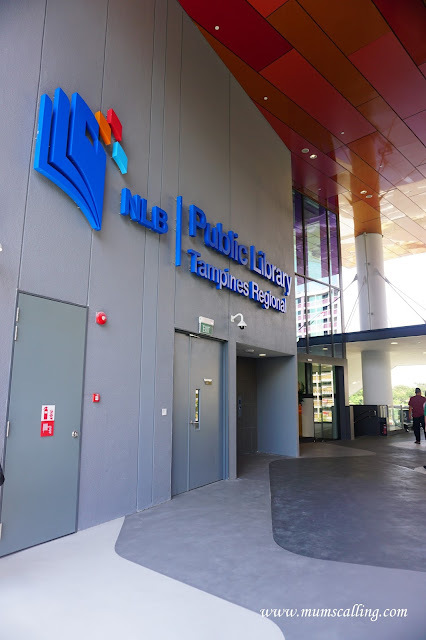 Tampines Regional Library at Our Tampines Hub re-opens on 5 August with a refreshed new look and features. It is the first library to be relocated to commercial space. 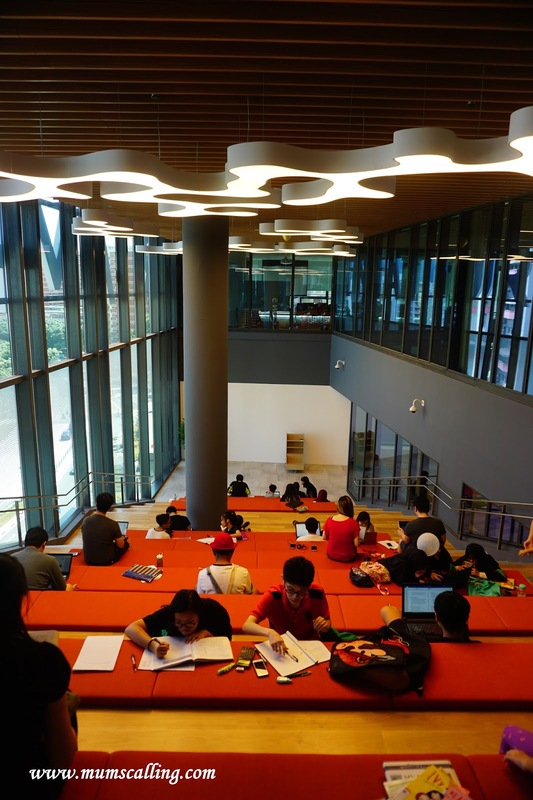 With this move, there is an increase of 76% floor area and 98% increase in seating capacity across 5 levels, providing more space for patrons to read and learn. We hopped on an exclusive library tour, through the different sections of the library that spans a total of 5 floors. The newly revamped library is impressive, smart and integrates very well with our developed nation of today. It's another local pride! Gone are the days of our old library scene that we grew up with, the refreshed libraries are bigger, better and more interactive. What's even better is that, there's an increase of 25% in book collection! Let's get on a photo tour. There are 2 entrances to the library on level 2. This entrance is known as Ave 4, the other is Ave 5, if I recall correctly. If you are driving and wish to park near the library, considering we often check out with tons of books, you may enter through Car Park entrance C and park near lots V24. 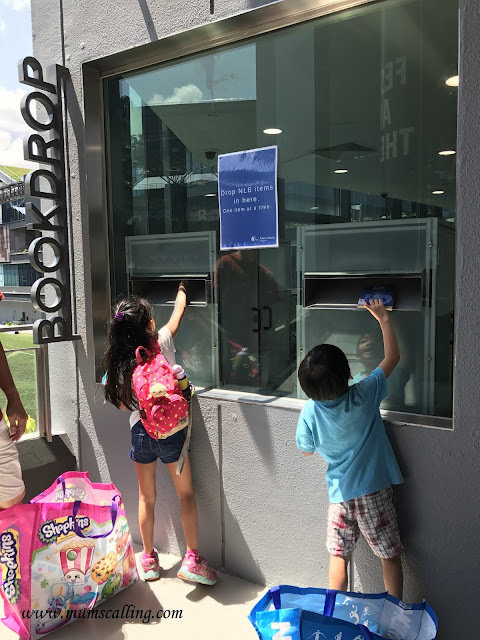 We brought our books along for return and the bookdrop area is just outside of the library entrance (Ave 4). It may be more ideal if there's shade and step ups for little ones at the bookdrop area. I mean the area is sheltered, just that the angle of the sun at that time was piercing in. Okay, because we were returning 72 books. Upon entering, we were much attracted and welcomed by these little structures which residents of the hood will find them familiar. They are the icons that made up Tampines. 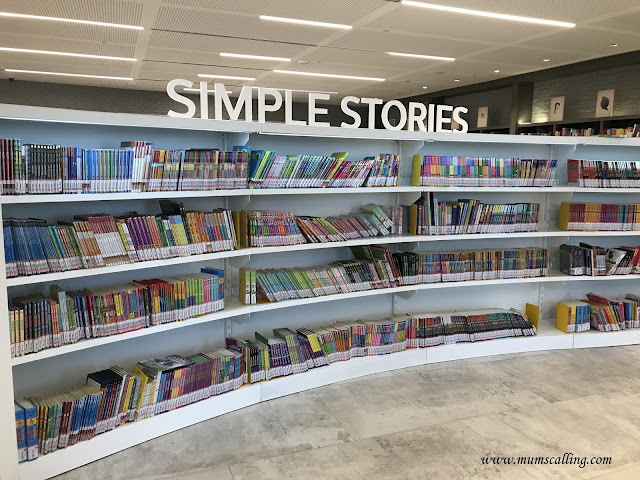 The new Tampines Regional library is a modern interpretation of the kampong, keeping with residents' desire to retain the kampong spirit of the estate as expressed during the earlier days. It was designed with the Tampines community in mind. 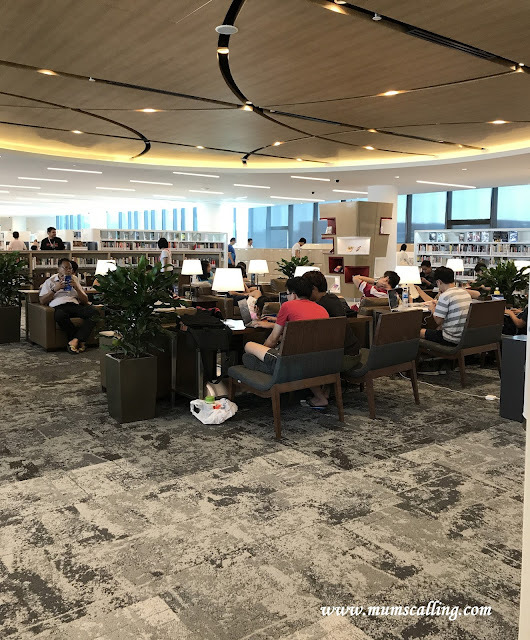 It gathered feedback from regular library patrons to craft cutomised spaces for all age groups including lounges for quiet reading, as well as selecting of furniture in the various sections. Absolutely thoughtful! There is a gallery developed by the National Heritage Board (NHB) that showcases the evolution of Tampines from its rural beginnings in the early 1800s to the town it is today. 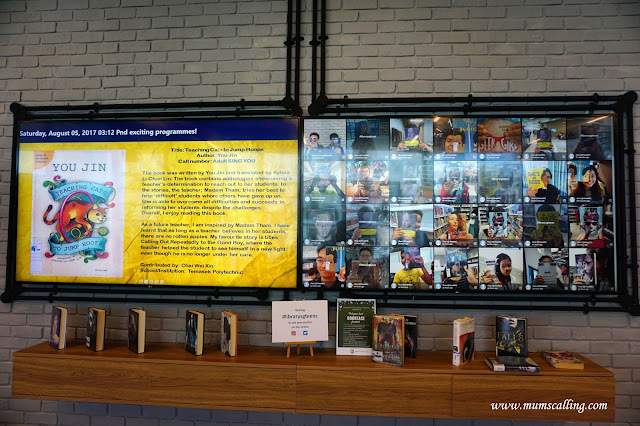 NHB and NLB work closely on the integrated programmes within the gallery and library. 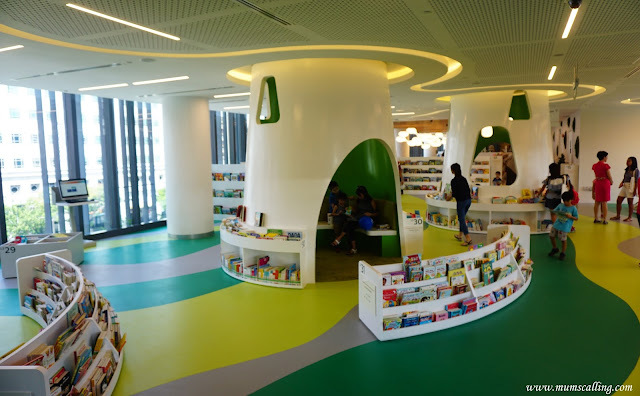 Look out for monthly storytelling sessions by librarians on children books themed on Singapore's heritage and culture. It is a space targeted at families with young children. 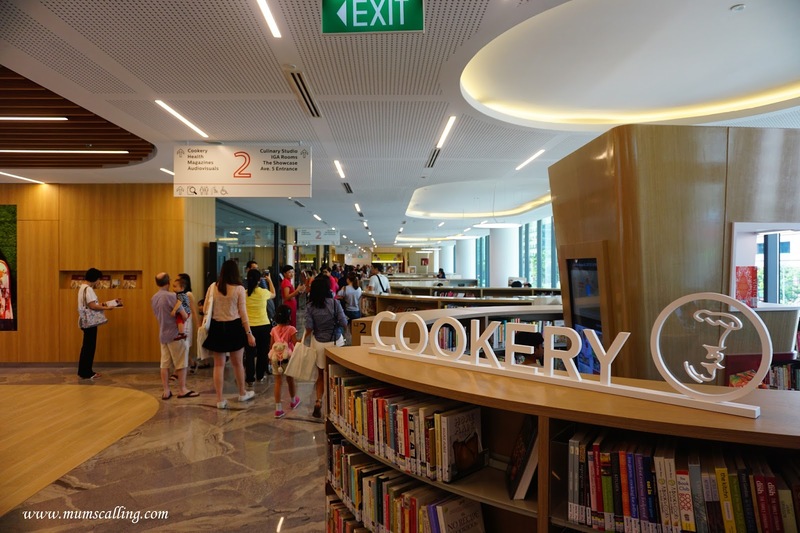 For the first time, NLB will be integrating its cookery collection with People Association's Culinary Studio within the library! In addition to cooking classes, NLB will be supplementing the space with a digital display of recommended read and videos to facilitate learning. 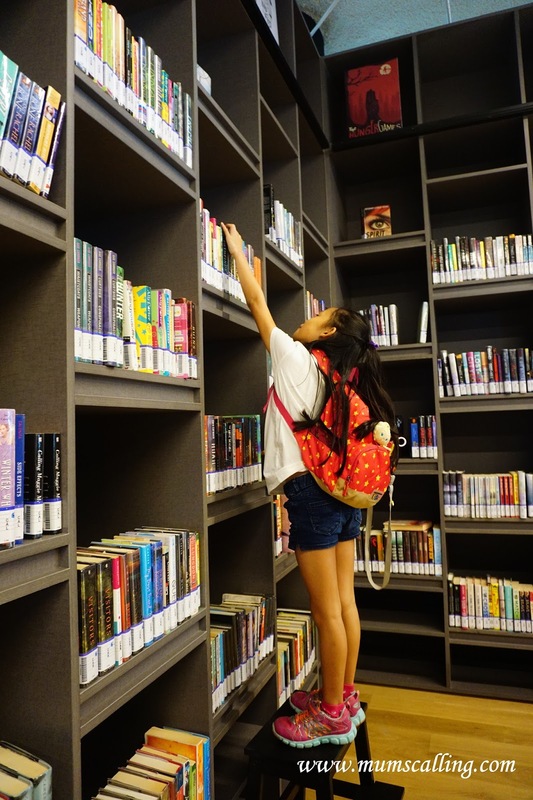 List of Tampines Regional Library Event here. As we toured into the magazines section, we spotted a lovely equipment that promotes and encourages non-sedentary reading. Yeap, there's only one. 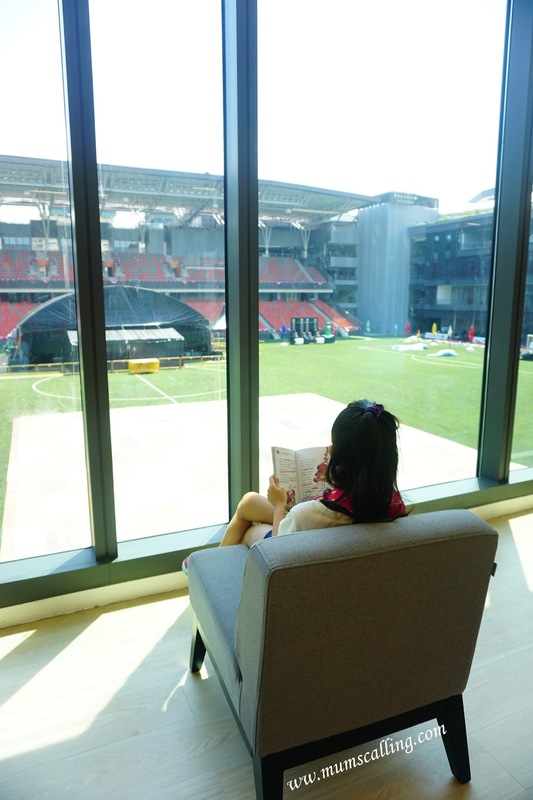 Next to it, a comfy chair that allows one to read and enjoy the therapeutic view of a green soccer field. Nature green is good for our eyes! This Early literacy floor is designed for parents and children. 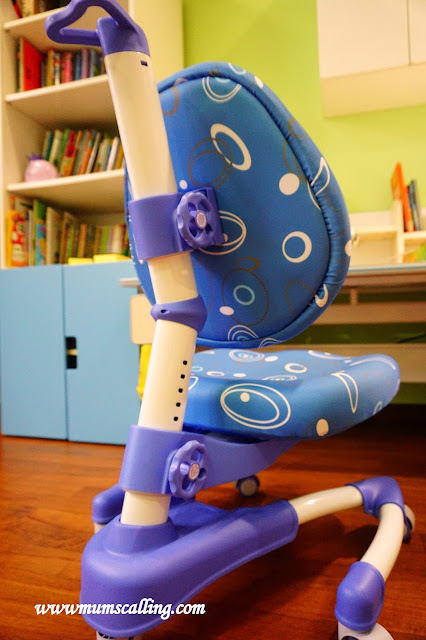 It has demarcated reading areas for children up to to 6 years old. 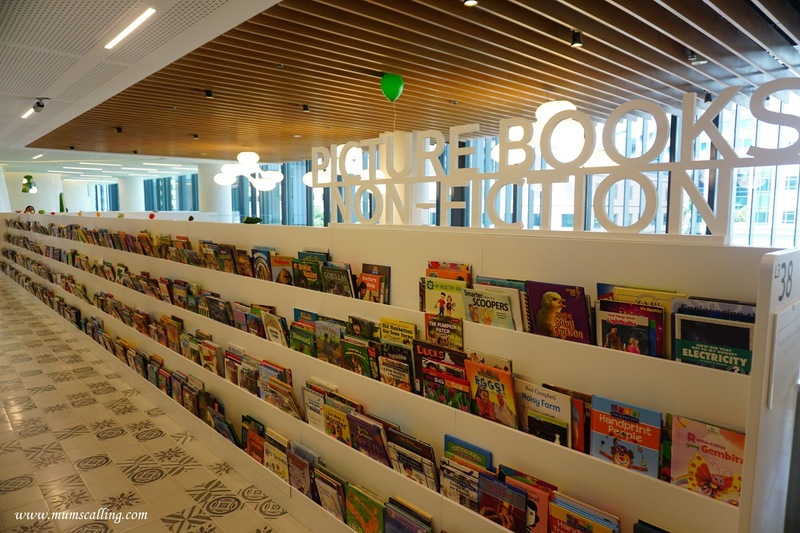 Something interesting and inviting about this area is that all picture books are shelved in a front-facing manner, to enable children to browse the books by covers instead of book spines. After all, toddlers are attracted by visual appeals! Spot too, the Peranakan tiles that weave into the kampong theme design. There is currently a void space that will be transformed into an indoor playground at a later quarter. It's in the pipeline that entrance will only be admitted with a fee. Chou Sing Chu Foundation has also donated 32,000 copies to the children's Chinese collection across two floors. They will also be holding regular Chinese storytelling sessions at the Early Literacy Library. Chinese Storytelling is held every first and third Saturday of the month, at 11.30am to 12pm. The Children and Teens space! The teen space aims to provide teens with a place to facilitate online and offline discussions. 2 screens are installed to kick-start social media conversations on current trends and issues. 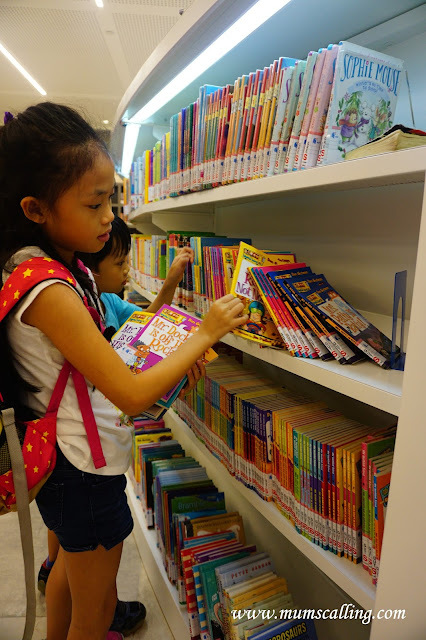 The Children section very much wow-ed my kids with their mint and newly added books! If your kids are into a series of reading like Geronimo, Weird school, Beast Quest and other popular series, the regional library is where you can hunt for them, in the complete range! As long as they are not on loan. And even if they are returned at other libraries, it will always be sent back to its original home. 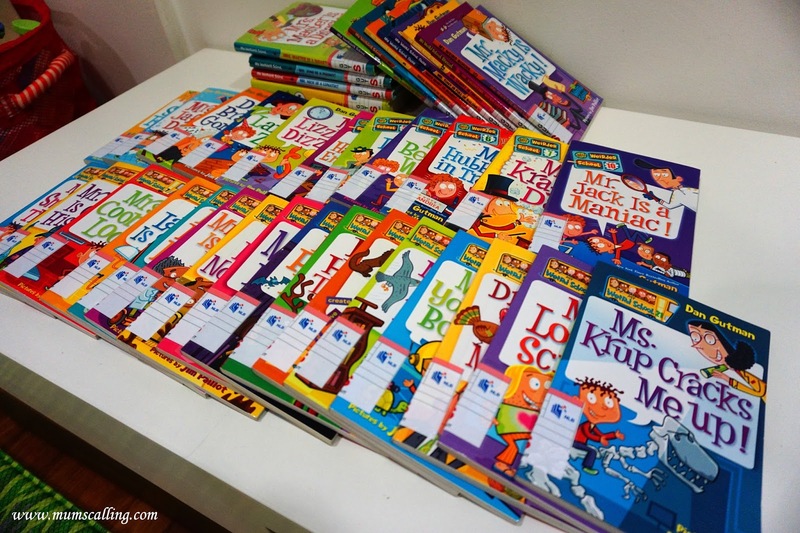 This was the stash Js swept off the shelves - My Weird school, My Weirdest school and Weird school daze series. Almost in complete volumes! I bet they had their hands first on these book, other than the librarian who shelved them. It's always nice to be reading books in excellent condition. So be kind and loving to library books! On the same level, there is a smart space of collaboration between NLB and Infocomm Media Development Authority (IMDA) - Pixel labs. 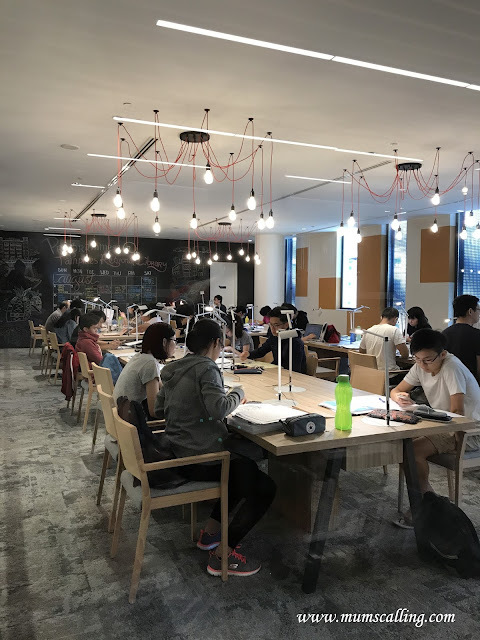 It offers dedicated space with tools and equipment like the 3D printer, Arduino kits and green screen where photos can be edited into nice scene of the library. 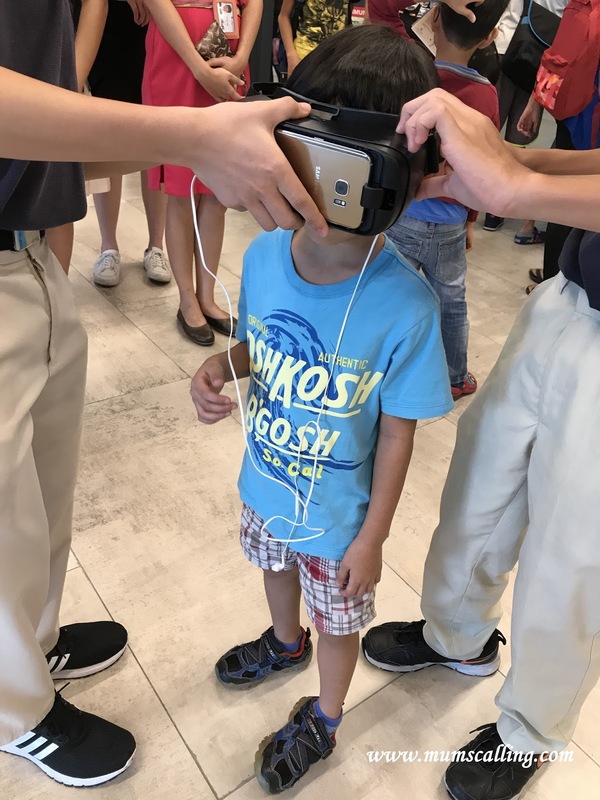 Programmes arranged by NLB and IMDA cover both tech and non-tech areas. 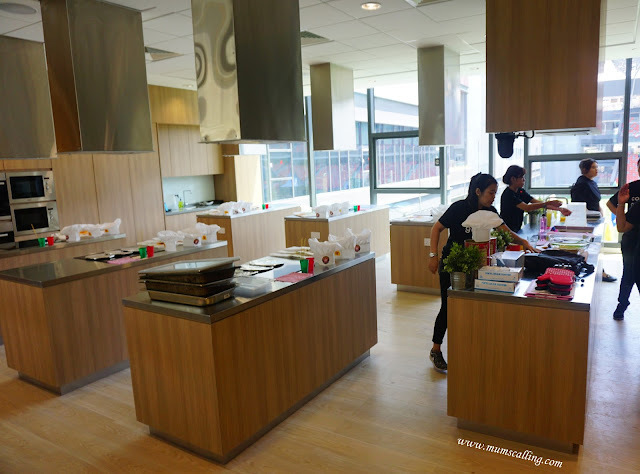 They include hands-on workshops for students and families, programmes from the young to old. Programmes are free! You may refer to the programmes booking guide here. A study lounge can be found at this level. It is a designated space for quiet reading and features tables and chairs that provide a more private space for intense reading. Look how well lit the place is, with a table lamp for every individual. This is also the level where we can find our Singapore collection of books, by local authors. Glad we have a corner to showcase and be called our own! This level is fully run by volunteers and aims to encourage users to self-facilitate while using library services. 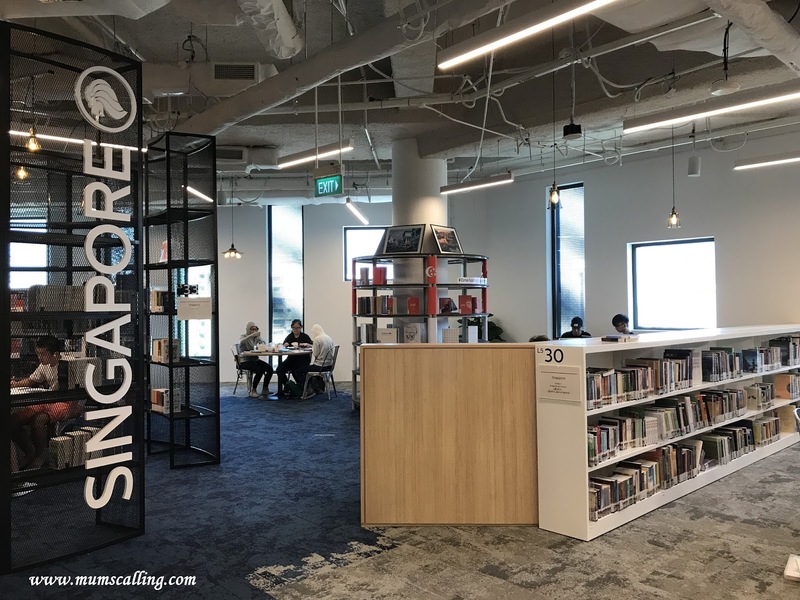 Besides large print books, this space also features Multimedia stations where users can browse digital and print newspapers, eMagazines and other NLB eResources. And we ended our tour on the final level, level 6. As a relatively new Mum, I need to highlight that there are 2 nursing rooms within the library. It's always a win to keep young Mothers in mind. We very much enjoyed our library tour and are very glad to have Regional libraries like such within neighbourhoods. 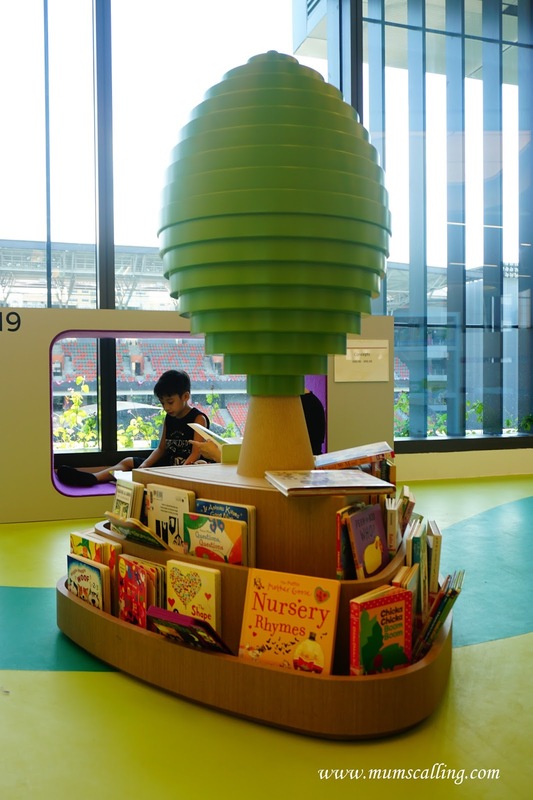 There are currently 3 regional libraries - Jurong, Woodlands and Tampines. These are where the most resources and titles are housed. We have also recently made life a little easier by downloading the NLB Mobile App. 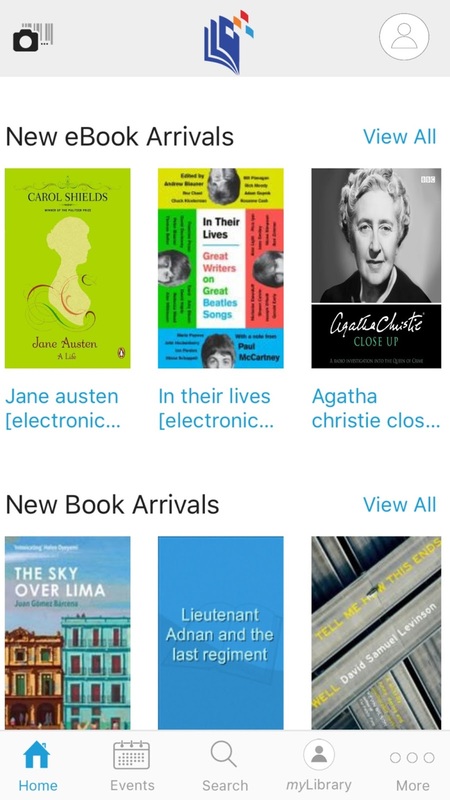 It allows us to read on the go, borrow, renew, reserve, as well as pay fines through it. Which means, I have 5 cards less to bring out! Borrowing just got more convenient. You do need to download the app, if you've not. Aren't we blessed to have resourceful libraries with a good range of titles and facilities?! Heartfelt gratitude.